It's been almost a week since I posted anything that's had a color makeover. I think it's about time for a seasonal decoration that involves spray paint! at the dollar store. They have a few styles to choose from. The only catch is that they're all for a certain holiday that's months away and that I'm just not ready to decorate for quite yet. I'm gathering things to decorate for Halloween. Well....get out the spray paint of course! they're just spooky enough for Halloween. and easy and looks great too? Oh I love this idea!!! I'm off to run errands, and I think a trip to the dollar store is in the cards... I wonder if they keep track of how many times I come in each week?? Oh my, I love this idea! I'm gonna have to make a little trip to my local dollar store and see what they have! I'm so glad I found your blog, I love your style. due to your wonderful inspiration(s), i have just brought a can of black spray paint into my house. i fear that once i start...i'll never stop!! first up - i'm trying to style my home for fall and halloween without buying anything new this year!! *gasp. * i think the spray pain will come in extremely handy!! I am glad I found your blog. I am out the door to see if I can find something similar at my local dollar store. This is really confirming for me that I need to become a dollar store shopper. Love this idea!! How cute would they be white/cream?! You could use for both Christmas and Spring! Great idea! Love all the decorations. Did you see the spooky black crows there? Fun fun! So smart! So easy! So perfect!! I swear woman....you are the QUEEN OF SPRAY PAINT...again another thing I wouldn't have thought of. Sheesh you never cease to amaze me! Check out my blog today, You inspire me!! Oh, I love this idea. I am going to buy some today.. Thanks for sharing. I know I would NEVER think to spray paint garland. That is what I love about your blog!! So creative! I love it! Gosh we have a Dollar Store here so I am on my way to get some of those...Boy I just can't get over the uses of spray paint...Thanks so much! I WOULD HAVE NEVER THOUGHT ABOUT SPRAYING BERRIES! Genius!!! Love it! What a great idea. I see one blogger posted about maybe painting some white or cream. That's a great idea too. Love it when someone thinks "outside the box"
I have to say that berry garland is one thing I never thought to spray paint! Awesome! Ooooh, love it! Putting this in my "sooooo copying THAT!" file. LOL. If u don't mind, that is. I'm soo copying that! Great idea! Simply lovely! They look so much better in brown and black. I would have walked right past them in their bright red state. Now, I think I LOVE it! I love this idea. I am so glad I found your blog! Hi Joy! Great idea! 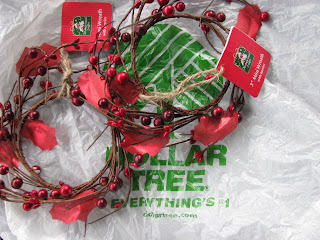 Now I'm going to have to dig around in the garage and see if I've got some old berry garland! Joy that turned out great. I bought some spring pip berry candle rings and spray painted them rust, I loved how they turned out. Spray painting is addicting!!! Cute, Joy! 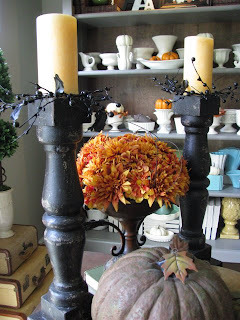 I found some candlesticks similar to yours last weekend for 50 cents each that I'm going to use for my fall decor. What a great idea! I like them so much better than the initial colors! I love that giant acorn on your mantle in your header photo! Where did you find it?! 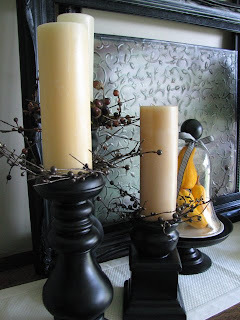 Spray painting the berry wreaths brown is a great idea for a fall accessory! Thanks for sharing! oh my gosh! I am so running to dollar tree first thing in the morning! AWESOME!!!! Love it! I would have thought of spray painting those! I might have to do that one myself if I ever get moved into my new house. Mind if I blame you when I can't get up on time tomorrow? I just spent a wonderful hour browsing your blog. You are one clever girl! You are a girl...right? Just kidding! So very cute!! I love this idea. You are so creative, thanks for sharing the goods with all of us! After seeing this, I'll be heading to Dollar Tree tomorrow!! I wish you could of been in my kitchen. My girlfriend and I looked up your blog and all you could hear was "Ahhh" or "Ooooh"...love that idea! Very clever and oh so cute! I saw those and thought they looked a bit sad so I didn't get them. Now I wish I had! I didn't even think of spraying them. Duh. I'm going back this week and getting a few. Thanks for the inspiration. Man i wish we had a dollar tree here. I love this idea!!! I love to spray paint stuff but I never would have thought of this. What color brown did you use, or just the cheap paint from walmart brown, Was one of the pictures painted brown? they both looked black I couldn't tell. I love your entire house of decorations! Would you please come do my house? so THAT'S the magic behind lots of projects, huh??? I thinks I got to head to the store ( AFTER I read some more of your blog )! I am now a faithful follower. Thanks for sharing all of your GREAT ideas! !